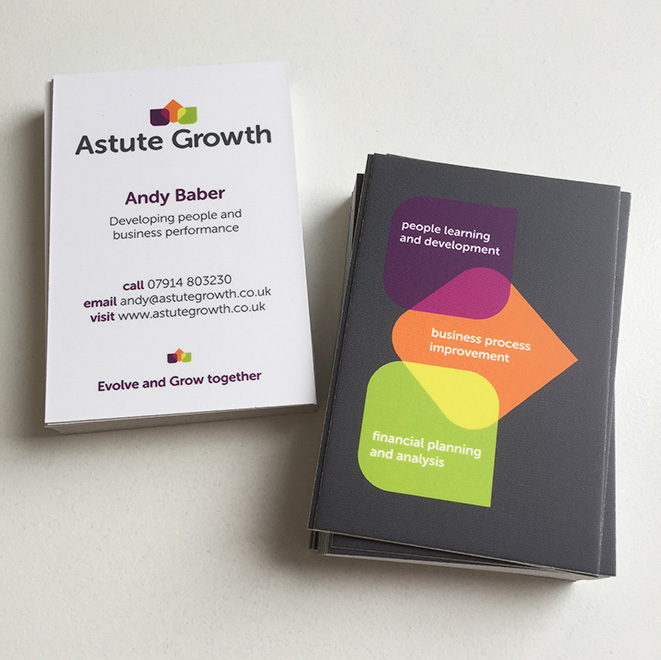 Astute Growth Limited are a start-up business specialising in Learning and Development for individuals, teams and businesses. I met founder Andy Baber at an Action Coach business course that we both attended and got talking about his new venture, for which he needed a brand identity. Astute Growth develops people and their performance, specifically through business process improvement, financial planning and analysis and also culture and change management. Andy was keen to develop a brand identity linked to his USP, the process that Astute Growth use to engage with their clients and deliver what they need, rather than what they think they want. The brand is aimed at individuals or businesses who are looking for help with challenges, changes, issues and problems impacting the individual, team or business. Aiming for clients including the aerospace industry and public bodies, Astute Growth is also looking to work with individuals who need learning and development support, which their employer doesn’t necessarily have direct access to. The aim of the brand identity was to evoke growth in a modern graphic way, without getting overtly flower, tree or plant-like. I came up with a simple, modern icon that hints at leaves or a flower in bud. The three overlapping graphic shapes also create a subtle orange arrow pointing upwards, highlighting the growth aspect. The three colours in the icon identity represent the three main areas of Astute Growth’s core business: People Learning and Development, Business Process Improvement and Financial Planning and Analysis. To give flexibility to the brand, two versions of the logo were created, a centred version and horizontal version. The icon can be easily used in social media applications as an avatar. For the reverse of the business card the main icon is turned on its side and used to highlight the three core areas of the business. The orange ‘arrow’ shape now points right signifying the movement of process improvement.